Every once in a while, a non-academic project rolls around that I get involved with. This is one of them. The university architects asked me to build an interactive campus history in Flash. As I was getting ready to start the project, Google Earth announced the release of the time line control- which allows users to see time-based information- if it is available. I decided it would be a good time to start experimenting with the technology. Since the back end of the Google Earth file runs on a database and streams as requested, the university can make different versions of the files to support different departments. Admissions can create a custom version to send to students who are interested in certain majors or aspects of college life. Campus Life can create custom versions to walk new students through their first day on campus. Architecture and Planning can create special versions for their visualization presentations. The list could go on. As of this writing I have already made plans to use the back end in two learning activities (coming soon). So after almost eight months, it’s finally live, but still a work in progress. As the file loads in Google Earth, the user is treated to 162 three dimensional buildings that represent Miami University’s campus. One of the more interesting features of this virtual world is the ability to go backwards in time. Miami’s campus began formation in 1824. So, users can roll the time slider back to any year in Miami’s history and see how the campus appeared in that moment in time. We worked with the university architects as well as the archivists to preserve the details as much as we could. Download and install the latest version Google Earth software (available at earth.google.com – version 4+ required) and enjoy a “flight” around the campus using this technology. For further information on installing Google Earth, see below. Download and open the Miami University file with Google™ Earth. You can control the various layers of information about the campus in the “Places” menu on the left side of the software. 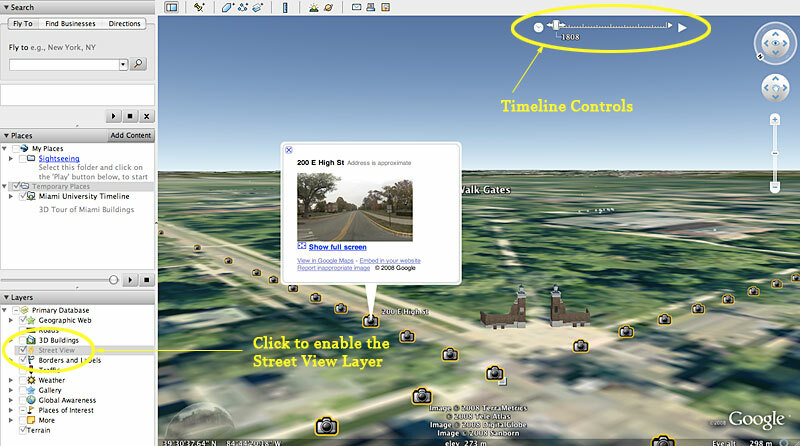 Once Google Earth Miami has loaded, use the timeline control to change which point in time of Miami’s Oxford Campus you’d like to view and enable “street view” in layers pane to see street level photography. This entry was posted in Interactive, Maps and tagged bicentennial, flash, google earth, Maps, miami by Britt Carr. Bookmark the permalink. Has Provost Herbst seen your work? This is great stuff, Britt! Thanks Todd. He has seen my work. It was when he was relatively new to Miami. I had to rush through the presentation, so I’m not sure he understood.